Abstract: Although not exactly new to gemology, surface ('bulk') diffusion-treated corundums (SDTCs) have recently been creating quite a stir in world gem markets, particularly the important Bangkok corundum market. The following article examines the subject in detail, starting with the original Linde patents and continuing up to the present day "Deep Diffusion" treatment. Methods of identification are discussed, as well as much of the backroom politics and maneuvering which has surrounded this controversial treated gem material. Also included is a quick-reference table giving a detailed summary of the key identifying features of all types of natural, treated and synthetic corundums. Figure 1. Four small untreated (0.50–1.00 ct.) rough sapphires from the Rock Creek area of Montana, USA (photo by Rattana Anghuanpanit, stones courtesy of Robert Stevenson). Funny isn't it how some things seem to come round full circle. That certainly seems to be the case with the so-called "Deep Surface Diffusion-Treatment" that's been grabbing headlines of late from Mandalay to old Bombay and right back in the U.S. of A. For those of you new to the news, since the beginning of 1990 the Bangkok gem market has been rocketed by rumors about a totally new method of putting the spit shine to blue sapphires. And separating the bulls from the fillies ain't been easy, no siree. Figure 2. The same type of Montana material as in the previous figure, in various stages of cutting after the surface-diffusion process. This material was treated in Thailand in approximately 1980–1981 (photo by Rattana Anghuanpanit, stones courtesy of Robert Stevenson). To get a handle on this subject, we have to take a journey through the past. Way way back to those days of the Linde Star. Linde Air Products was a division of the giant American conglomerate Union Carbide (of Bophal, India fame). At the outbreak of World War II, it became clear to the US government that certain materials of strategic importance might be difficult to get if no American company was manufacturing them onshore. One such material was synthetic corundum, which had hitherto been made primarily in Europe. Thus, the US government asked certain American corporations to undertake the manufacture of materials which would come in handy if push came to shoot. Union Carbide got the nod for synthetic corundum and began manufacturing it in 1942 (Nassau, 1980). Not even the most long-toothed soothsayer could have then predicted the impact this decision would have on the future of gemology. In the late 1940s, after the war was over, Union Carbide's Linde Air Products division continued making synthetic corundum, and it was during this period that an extremely astute employee, John Burdick, noticed in one of the boules a cloudy patch which later proved to be rutile silk. Much experimentation later, the growth of this silk could be controlled to the extent that synthetic star corundums became a commercial reality. Thus, the birth of the Linde Star, which went on sale in September of 1947 (Nassau,1980). Now while all this is well documented (Nassau, 1980, 1984a), the manufacture of Verneuil synthetic corundums was not a completely cut-and-dried process. Problems were encountered in the consistency of color and silk, in both transparent and star corundums, particularly those of a blue color. Linde toiled on. The result was a series of patents (Carr & Nisevich, 1975, 1976, 1977) providing a means of diffusing coloring agents into and just beneath the surface of corundums by heating them near to the melting point in a paste of titanium and other coloring oxides (Cr, Fe, Ni, V, etc.). Temperatures described in the patents were between 1600 and 1850° C. Below 1600°, the process was said to be too slow; above 1850°, the powder fused to the surface of the stone, requiring heavier repolishing and subsequent loss of color. The time given for the heating ranged from 2 to 200 hours, depending on the nature of the crystal. Figure 3. Methylene iodide immersion coupled with magnification clearly reveals the difference between an SDTC and a sapphire heated in the normal way. The SDTC has a d ark girdle, dark facet junctions and sharp changes in color which follow the facet pattern exactly. At right, a non-SDTC sapphire shows a near-invisible girdle and facet junctions, with the color pattern being generally unrelated to the facet pattern of the stone (photo by Wimon Manorotkul). Interestingly enough, while the patents were granted in 1975–1977, they were actually a continuation of an earlier application from 1971 (subsequently abandoned). Equally interesting was the fact that some of the later patents were issued in the name of Astrid Corporation of Hong Kong. Even more intriguing was that after the patents were granted, nothing much was heard of the process until approximately 1980. Then it was rumored that the giant Swiss gemstone firm of Golay Buchel purchased the patent rights from Union Carbide and began processing pale-colored natural Sri Lankan sapphires by the surface diffusion process (hereafter Surface Diffusion-Treated Corundums will be abbreviated as SDTCs). This material hit the market in 1980–81, mainly in blue colors, but oranges and reds were also reported. Furthermore, it was possible to diffuse not only color under the surface, but also titania (TiO2), which upon further heat treatment turned into rutile silk, resulting in surface-diffusion star stones. To their credit, Golay Buchel reportedly sold the material for what it was – surface diffusion-treated corundum. Unfortunately, those who bought from Golay Buchel were not always so benevolent. One well-known Italian colored-stone dealer told the author that in Italy large quantities of this material were passed off on unsuspecting customers. He also alleged that when a local trade association was informed of this fraud, the entire matter was swept under the carpet because, in the words of my informant, "they had sold a lot of stones." Such stories are not confined to Italy; the author has personally witnessed surface diffusion-treated sapphires being sold as natural in Thailand, and the same could probably be said for any country where sapphires are traded. Once the general process of surface diffusion became known, via cook or by book (Noyes Data Corp. published two books of gem patents which served as burners' recipe bibles), it was not long before Thailand's skilled gem chefs also had a go at it. I was shown a parcel of obvious SDTCs in the famous gem-trading market town of Chanthaburi around 1980–1981. After informing the broker that I knew exactly what he was holding (i.e., SDTCs) and telling him that I was still interested in buying a piece, I asked if the process was done abroad. The broker said, no, these were cooked in Thailand. This was made all the more believable because each stone in the lot had a far lighter color than we had come to expect from the Swiss production, no doubt because the process had yet to be perfected here. Improper treating or too heavy a hand on the polishing wheel will result in most of the color being lost. Further evidence of surface diffusion treatment being done in Thailand was presented to the author by a close friend, Robert Stevenson, who had sent some (non-Yogo) Montana sapphires to his friendly neighborhood Bangkok burner for cooking sometime about 1980–81. Before treatment, the stones were pale green-blue. To his delight, after cooking, each had metamorphosed into deep blue beauties entirely inconsistent with what typically happened when burning this material. Elation soon turned to sorrow, though, when after cutting, the blue color had disappeared into the dust on the polisher's wheel. Specimens of this very material were donated to AIGS by this gentleman, and are pictured in Figures 1 and 2. Figure 4. Several faceted D-SDTCs are seen with magnification and immersion in methylene iodide. Note the strong color concentrations on most facet junctions, the stress fractures produced by prolonged heating and the bleeding of color into fractures, pits and feathers (photo by Wimon Manorotkul). It's Instrumental, My Dear Watson! Identification of surface diffusion-treated corundums is a fairly straightforward process in many cases, but there are just enough potholes in the road for the unwary to fall into. In most cases, a stereoscopic microscope (with provisions for immersion in methylene iodide) is necessary. The identification centers around the fact that, in natural corundums, crystals grow in the ground and such crystals bear only a cursory relationship to the gemstone after cutting. Color in natural single crystals forms in bands or zones parallel to crystal faces, not along polished facets, because the stone was not faceted when it was growing in the ground. Despite the irrefutable nature of that last statement, some have attempted to hoodwink people into believing otherwise. But more about that later. Proper setup and use of the microscope is vital to the identification. The stone should be immersed in pure methylene iodide (RI = 1.735 approx.) and viewed under magnification with a diffused white (frosted) plastic or glass plate covering the light source. This is often referred to as diffused light-field illumination. Under these conditions, reflections from the corundum's external surfaces are largely eliminated. This allows the stone's interior to be seen with virtually no distortion from the reflection and refraction of light off internal and external surfaces. Thus, the true distribution of color is revealed. 1. a. The color of SDTCs will be seen to be concentrated just inside the girdle of the stone, unless cutters have attempted to avoid detection by heavily repolishing the girdle itself and the facets close to the girdle. This is because the coloring agents are concentrated close to the surface; when the stone is placed table down in the immersion cell, one's line of vision crosses the greatest amount of diffused color in the vicinity of the girdle. In a non-SDTC, the color is inside the stone and is distributed throughout the entire volume; therefore, one looks through the greatest amount of color at the culet (viewed table down in the immersion cell; see Figure 3). b. The color of SDTCs will also be seen to be concentrated on the facet junctions. This results from a greater penetration of the coloring agents at edges as opposed to the center of facets (Koivula, 198? ), as well as the fact that edges are polished less during the mandatory repolishing that stones must undergo after treatment. According to Koivula, convection currents develop during the treatment that create a "dumping" of colorants at the edges. This is, I suppose, somewhat similar to the dumping of alluvium at a bend in a river. The result is a deeper penetration of coloring agents at edges and facet junctions, as compared with the center of facets. 2. If an SDTC has any fractures, feathers, cracks, pits, cavities, etc. which break the surface, then immersion reveals a "bleeding" of color into these breaks. Even well-healed liquid fingerprints can show this effect, but it is seen best, of course, in completely open cracks. The reason for the bleeding of color is that the cracks offer a ready means for the entry of the coloring agent, but are not touched during the repolishing process. 3. One further means of identifying SDTCs exists, and of late has become the most important. As mentioned earlier, color in natural corundums forms along specific directions representing crystal faces (or potential faces) of that mineral. In the SDTCs, the penetration of the process is so shallow (0.05 to 0.50 mm) that the stones must be preformed before the treatment is effected. To treat a rough gem would be to lose a large percentage of the color in the cutting process; thus, the treatment is done on preforms rather than rough stones. Because of this restriction, and because of the high temperatures reached, the gems must be repolished after treatment. Inevitably some facets will be polished more than others, resulting in the color pattern of the finished stone following the facet patterns exactly. Some of the facets will show more color, some will show less, but the color pattern will follow the facet patterns exactly. This is absolutely without a doubt the most sure-gotcha-spot on positive way of identifying SDTCs that I am aware of. As mentioned earlier, the identification of SDTCs is not something to be approached lightly. The first requirement is to get your hands on some of those 100% sure-gotcha-spot on-positive SDTCs. More than one piece, if at all possible. Then these can be used to make side-by-side comparisons with unknown stones. I am gonna say something now which I probably shouldn't say (and I'll probably regret it at age 65), but it needs saying. Any gemological laboratory can make mistakes in gem identification, and I do (read my lips) include AIGS and every other major gemological lab in the world in the discussion. 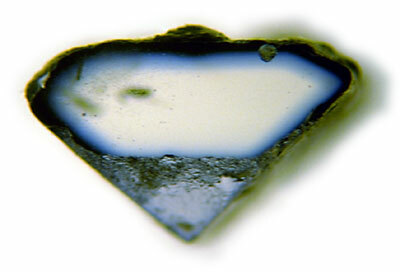 For example, in November of 1988, the AIGS lab in Bangkok misidentified an ordinary heat-treated sapphire as being surface diffusion-treated because the gemologists who tested the stone saw a reflection on the girdle (the girdle was quite thick) and misinterpreted it as color concentration from a surface diffusion treatment. In April of 1990, I was shown photocopies of two gem ID reports for what appeared (same measurements, weight, shape, etc.) to be the same stone, issued by a well known US-based laboratory. The first report stated that the stone was a heat-treated natural sapphire, while the second report said that the stone was a "diffusion-treated natural sapphire". As this article was being written, a stone came in to the AIGS lab which illustrates quite nicely just how careful one must be in identifying SDTCs. The stone in question was an obvious flame-fusion synthetic sapphire, but in immersion showed the dark facet junctions normally associated with SDTCs, leading one of the two testers to initially believe it to be an SDTC. But later examination failed to show up the telltale conclusive sign of the SDTC: the color did not follow the facet pattern of the stone exactly. This pseudo-SDTC appearance was probably a result of the rounded facet junctions common in Verneuil synthetics (due to rapid polishing), as well as the tendency of synthetic blue sapphires to have color wrapping around the pavilion facets, because the boule is colorless near the core. Again, beware. The job of gemologist becomes ever-more difficult with each passing day. In mid-1988, the AIGS lab in Bangkok again began to see SDTCs, but this time with a slightly more sinister glint. It had always been in the back of the author's mind that someday the treaters were going to wise up. Rather than just taking near-colorless sapphires and treating them to a deep blue, someday, somebody, somewheres was gonna take a stone which already had a lot of color of its own and just give it, via surface diffusion, a bit more ooomph for the dollar. This is what happened starting in mid-1988 – to such an extent that we reported the matter to the ICA (Hughes, 1988, ICA Laboratory Alert #12). Treaters were apparently taking mostly medium quality Kanchanaburi sapphires that had lots of color of their own, but were heavily zoned, and surface diffusing their problems away, so to speak. One additional monkey wrench thrown into the broth was the publication about mid-1988 of an anonymous pamphlet (in Thai), superficially claiming to tell the readers about gemstones, but serving primarily as a vehicle for attacking the AIGS lab  for their position on identifying SDTCs. The starring attraction of this pamphlet was a set of alleged correspondence between the anonymous author (who published the pamphlet under the moniker of Ploi Sahm See – literally 'Tri-Color Gem') and the chairman of the a well-known gemological organization. The chairman (if in fact it was his real correspondence that was reproduced) perhaps lacked full details of what was going on in Bangkok; he thus found himself unwittingly sitting in judgment on a matter of which he had only the word of a distant gem dealer. In his first letter, the chairman attempted to avoid committing himself without further study and information, speculating about how if the stones were heated only on the surface then maybe and quite possibly, they could conceivably and perchance just might be something other than surface diffusion-treated after all. Reproduced on the following two pages are the title page of and letters from this pamphlet (with the names removed to protect the innocent). Figure 6. Correspondence reproduced from an anonymous Thai pamphlet attacking AIGS for identifying stones as surface-diffusion treated. 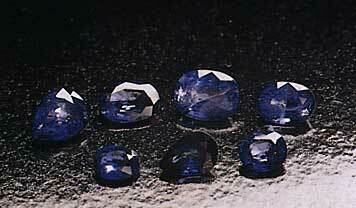 The reasons for the decision made by the (name removed) laboratory that the sapphires were diffused are evident. The results are so subtle, however, that it would hardly make sense for anyone to diffuse a sapphire, when so little is added to the color. It would appear as if the results were what might be termed accidental, caused by heating that was effective only to a depth that did not penetrate very much beneath the surface. In other words, it appears as if the results of the treatment were confined to near the surface of the stone. It is indeed unfortunate that the author of the pamphlet did not see fit to reproduce the lab reports on the stones, if in fact such reports were made. It seems that, while those who examined the stones did find evidence of surface diffusion, the amount of color added was far less than what gemologists had been used to seeing. Therefore they could not understand why someone would go to so much trouble to add so little color. What they misunderstood was that even a minor color zoning problem can dramatically lower the value of a sapphire. Rather than taking $5/ct material and diffusing it into $500/ct gems, as was previously done, the burners were becoming more clever. 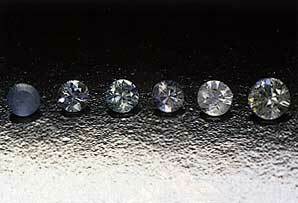 Now it was slightly zoned $200/ct stones that after diffusion might be worth $300–400/ct. Figure 7. One of the "famous five." This photo shows a magnified view of a surface diffusion-treated sapphire (probably of Kanchanaburi origin) while immersed in methylene iodide. The owner of this stone claimed that it had received "surface heat" rather than "surface diffusion." Please note that these stones do possess a great deal of internal color (arranged in a pattern due to partial dissolution of rutile silk during heating). However, the evidence of surface diffusion still remains on certain facets, particularly those shown by the arrows. On these facets, the color pattern exactly follows the facet pattern, with adjacent facets having less color. This is positive evidence of the surface diffusion process (photos by the author). This failure to make a clear statement about just what type of treatment the stone(s) had been subjected to was misinterpreted by the author of the pamphlet as representing something akin to the GoodStone Burning Seal of Approval. Unfortunately, no attempt was ever made to contact AIGS to see if we might have additional information. Tee, hee, hee, he agrees with me – my stones are not SDTCs – AIGS should take up growing tea – stay away from gemology. The anonymous pamphlet was just the first shot fired across our bow in the Battle of the Surface Diffusion Sea. Coupled with the one misidentification by AIGS on an ordinary heat-treated sapphire, rumors began circulating that AIGS had its head well into the nether regions of its backside, to such a degree that "many heat-treated stones were being misidentified by AIGS as SDTCs." This latter statement is absolutely wrong; to the best of the author's knowledge, only one SDTC stone (the one already described herein) has been misidentified by the AIGS lab in Bangkok. So we took the stones back to the lab, gave them a look-see and, sure enough, every damned one was an SDTC. Being modest in such matters, particularly when immodesty could result in a very fast descent into the next world, we admitted to this gentleman that we could be in error, and offered to send the stones at our own expense to any lab in the world he thought capable. He replied that he didn't need any lab to tell him what he already knew about his own stones. So much for "head for breakfast." Figure 8. A preformed D-SDTC in which the ends were polished as parallel surfaces, revealing the depth of color penetration when examined under magnification. On a fully faceted and polished D-SDTC, the deepest color penetration measured was 0.40 mm. (photo by Wimon Manorotkul). Starting in mid-1989, we began to hear about deep surface diffusion-treated corundums (hereafter referred to as D-SDTCs). At the beginning of April, the author, having heard through the grapevine who was involved, approached the principals for more info. They were more than generous in offering samples for study, as well as much information about their plans for the material. Since Mr. Peter Lumetta, whose article follows this one, explains what they are intending to do, I will not repeat it. Suffice to say that they fully intend to sell the material for what it is – surface diffusion-treated corundum. Why has this created such a furor when the earlier goings-on made not even a ripple? Good question. Mighty good question. And might it have something to do with the fact that the earlier doings were "in house" so to speak, while the later shenanigans are being perpetrated by, god-forbid, heathens from out of town? I'll let readers make up their own minds on that one. Surprisingly enough, amidst the rumors that the new D-SDTCs were both undetectable and absolutely aimed at destroying the local sapphire market, another question popped up. It seems that many potential buyers were bothered not so much by the fact that the color is entirely a work of fiction. No, what they wanted to know was if the color was a coating on the outside of the stone, or if the color actually extended inside the gem. If it is outside? No dice, no sale. And if it's inside? No Proble~mmmmm! This stone has been treated by the surface-diffusion process. Some or all of the stone's color is artificially created, and lies in a thin layer at and just below the surface. Repolishing/recutting may result in a substantial loss of color, but otherwise the color is generally stable. It is hoped that these new comments will make clear the fact that the color is inside the stone. More importantly, the comments should make clear to the buyer that the color is both a product of human synthesis and is confined to such a shallow depth that simple repolishing may result in loss of color. While some may not be happy at the clarity of these comments, we at AIGS believe that a lab's actions should be governed by "Beesley's Law,"  which, in a nutshell, is: "Put yourself in the shoes of the buyer. What would you want to know if you were buying the stone?" Figure 10. 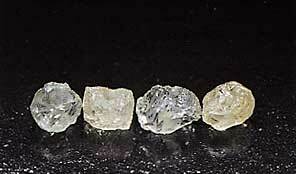 A suite of seven D-SDTCs after faceting. The stones range in size from one to two carats each (photo by Rattana Angkuanpanil). But Where Is The Motive, Dear Watson? From the above description, I am not quite sure what is being described, but it certainly does not sound like a surface diffusion-treated corundum, unless the references to a "coating" are merely describing a region of the gem near the surface. What bothers me most about this, though, is the lack of motive. Why on earth would anyone go to all the bother of the SDTC process, which does cost money, when off-the-shelf Verneuil synthetics are available in orange colors anyway? Grahame Brown himself said, with more than just a touch of skepticism, "As this Australian tourist only paid US$35 for the complete suite of imitation padparadscha sapphire jewellery, one must wonder at the economics upon which the production of diffusion coated synthetic corundums is based… and the naïveté of some tourists." (Brown, 1990). As the same lab alert also described blue sapphires (which also were diagnosed as being surface diffusion treated on the basis of highlighted facet junctions), it makes me wonder if we don't have another case of ordinary Verneuil synthetics being mistaken for SDTCs, like that described earlier. Since Grahame Brown is a regular contributor to this magazine, we hope he can shed further light on these odd stones. Just What Is The Difference Between Premium And Regular? …generally is about 0.001 to 0.020 inch (0.0254 to 0.508 mm) in thickness after polishing. This thickness is determined primarily by the time and temperature of treatment… and to some extent by the atmosphere in the furnace. Generally in a reducing atmosphere deeper penetration is obtained in shorter time than in an oxidizing atmosphere. (Carr and Nisevich, 1975). Kurt Nassau's Gemstone Enhancement (1984a) also mentioned penetration levels, which I think are derived from the same patents, but oddly enough gave different values. According to Nassau, Linde was able to achieve depths of color penetration "of about 0.004 to 0.01 inches (0.01 to 0.25 mm)." A conversion error between inches and millimeters seems to have sneaked in, too, for 0.004 inches actually equals 0.1016 mm, not 0.01 mm (as quoted). From the above sources, I think it is safe to say that the Linde process was capable of producing color penetrations of somewhere between a few hundredths to as much as one half of a millimeter, after polishing. The deepest we've measured on this new D-SDTC is 0.40 mm. But, we did cut open one small Golay Buchel stone which we had around, and found a penetration of less than 0.10 mm. All of the D-SDTCs we've sliced open have shown at least that much, so they do appear to be approaching the maximum limits claimed by Linde. But in light of the above, if the new material qualifies for the title of "Deep Diffusion-Treated," then some of the Linde material with the 0.50 mm penetration might best be called "Super Duper Deep Diffusion-Treated." But Is It Really Natural, Ma? I'm going to beat the "natural vs. treated" horse a bit more. In the article which follows this one ('The Diffusion Confusion') Mr. Lumetta refers to SDTCs as natural stones. On this theme, Peter and I do not see eye-to-eye. I would like to take issue with his use of the term "natural" in the context of SDTCs, but at the same time I must confess a certain bias. Peter Lumetta is a good friend of mine. Thus, in respect of our friendship and for the purposes of this debate, I will avoid any and all mention of his family in general, specifically the matter of his questionable parentage and his father being a hapless rogue known far and wide for his love of wild women and hatred of anything falling under the vague rubric of work. These things I will not mention. Ah… now… where were we? Yes, the idea that SDTCs might represent one category of natural stones because the starting material is natural corundum. I think it would be correct to say that Mr. Lumetta considers SDTCs as a subclass of natural corundum. Sorry, but I just don't buy it. While the crystal structure may have formed in nature, both the clarity and color have been "synthesized." However, Mr. Lumetta does make an excellent point, which is that SDTCs are little different from normal heat treatment: one represents diffusion out of the stone (ordinary heat treatment); the other represents diffusion in (SDTCs). Mr. Lumetta argues that those who support the sale of ordinary heat-treated corundums as natural while refusing to allow the natural moniker for SDTCs are guilty of more than just a wee bit of hypocrisy. While this idea may be considered heretical among dealers,  I agree totally. Both the normal heat treatment and the SDTCs are just variations on the same diffusion theme. Ordinary heating diffuses aluminum vacancies and hydrogen in and out; the surface diffusion process works in the same way, but with heavier elements (Ti, Fe, etc.). What upsets many dealers, I suppose, is the efficiency of the SDTC process. They should have thought of that before they started burning Sri Lankan geudas and selling them as natural. This failure to see into the gem treatment future will be the downfall of the natural stone business unless a clear distinction is made between natural and human products. Take a good look around. How many purely natural gems are left? But With Ordinary Heat Treatments, Nothing Is Added, Is It? Nothing could be further from the truth. Human intent is added, and that is most important in separating natural from synthetic. It's not what is done, but who's doing it. Other than that? Heat, oxygen, hydrogen and various other items are either added, subtracted or altered during the heating process. It should be obvious that if nothing were changed, then nothing would change. Where I differ from Mr. Lumetta is in the label attached: he calls both the heated and the SDTC "natural," and following the past trade practice of allowing the term "natural" for heated goods, I suppose I should agree. But I can't. I call them both partial-synthesis processes and most decidedly not natural. The term "natural" as we define it at AIGS, is given on the inside cover of this magazine ('How to Read the Gemological Digest'). In a nutshell, a gem is natural if it has not been altered by humans beyond ordinary cutting and polishing (grinding only, no impregnations). Readers, what think ye? The Bottom Line: Is It Really Better? Is it really better? Nothing I've been shown so far has a better appearance in any way than the original early 1980s Golay Buchel material. All of the SDTC material I've seen to date has a peculiar "steely" quality to the blue which does not duplicate the appearance of top Burma-type natural sapphire. The D-SDTC material is no different. So in that way, no, it doesn't look better. It may be better for the producer, though, if in fact they can get better color penetration, because a deeper penetration makes for higher yields in cutting. Is It Any Tougher To Identify? Is it more difficult to identify? From what I've seen so far, absolutely not. It can be identified in exactly the same way as any other SDTC. Just before our deadline for this issue, I discovered, in a dusty turn-of-the-century journal, a description of a treatment process which may be truly revolutionary! Rather than using large sapphires, it makes use of microscopic Enhanced Alumina Sapphire™ particles (impure pieces of sapphire, which could have become fine sapphires had they remained in the ground a bit longer). In a process which essentially finishes the job that nature started but adds nothing, the particles are dropped through a flame (heat only), where they enhance themselves naturally into fine sapphires. The finished product provides 100% color penetration through any size stone – they can be recut with absolutely no danger of color loss. Even more incredibly, the enhancement process can result in large sizes approaching 100 carats cut, just perfect for producing – you guessed it – calibrated sizes! It's a jewelry manufacturer's nirvana. Well, by golly, gosh and god, why hasn't anyone done anything with this process? They have. It's called the Verneuil process. The author would like to thank the following people for assisting in the writing of this article. A collective numero uno on the list has to be Messrs. Tom Palmer, Jeffrey Bergman and Peter Lumetta, who went far beyond the call of duty in donating numerous specimens for study, in opening and copying their extensive files for the author, and for a general willingness to discuss the subject in an open and open-minded fashion. It was a pleasure to work with them on this, and I wish them the best of luck in their future endeavors. Thanks are also due to Robert Stevenson for the kind donation of untreated and surface diffusion-treated (non-Yogo Gulch) Montana sapphires, R. Scott Montgomery for polishing some of the specimens, and to Willie Sersen and Hank Ho for their usual (and always necessary) meticulous reading of the manuscript. Finally, to Olivier Galibert, for the title photograph. Brown, Grahame (1990) Diffusion coated synthetic sapphire. ICA Laboratory Alert, No. 37, April 26, 2 pp. Carr, R.R. and Nisevich, S.D. (1975) Altering the Appearance of Sapphire Crystals. US Patent 3 897 529, July 29. Carr, R.R. and Nisevich, S.D. (1976) Altering the Appearance of Sapphire Crystals. US Patent 3 950 596, April 13. Carr, R.R. and Nisevich, S.D. (1977) Altering the Appearance of Sapphire Crystals. US Patent 4 039 726, August 2. Crowningshield, R. and Nassau, Kurt (1981) The heat and diffusion treatment of natural and synthetic sapphires. Journal of Gemmology, Vol. 16, p .315. Crowningshield, R. and Nassau, Kurt (1982) The heat and diffusion treatment of natural and synthetic sapphires. International Gemological Symposium, published by the Gemological Institute of America, pp. 101–109. Eversole, W.G. and Burdick, J.N. (1954) Producing Asteriated Corundum in Crystals. US Patent 2 690 630, October 5. Gunawardene, Mahinda (1984) Contribution towards the identification of treated corundums: heat and diffusion-treated rubies. Journal of Gemmology, Vol. 19, pp. 298–310. Hänni, H.A. (1982) Characteristics of heat-treated and diffusion-treated corundums. Swiss Watch and Jewelry Journal, 5/82, pp. 573–577. Hughes, Richard W. (1988) Reappearance of surface diffusion treated sapphires in Bangkok. ICA Laboratory Alert, No. 12, October 21, 2 pp. Kane, R.E., Kammerling, R.C., Koivula, J.I., Shigley, J.E. and Fritsch, E. (1990) The identification of blue diffusion-treated sapphires. Gems & Gemology, Vol. 26, No. 2, pp. 115–133. Koivula, John (198?) Detecting corundum treatments. GIA video tape. Nassau, Kurt (1980) Gems Made By Man. Chilton Book Co., Radnor, PA, USA. Nassau, Kurt (1981) Heat treating ruby and sapphire: technical aspects. Gems & Gemology, Vol. 17, p. 121. Nassau, Kurt (1982) Color enhancement of gemstones: heat treatment of corundum. International Gemological Symposium, published by the Gemological Institute of America, pp. 111–117. Nassau, Kurt (1984a) Gemstone Enhancement. Butterworths, London, UK. Nassau, Kurt (1984b) Heat treatment used on gemstone materials, parts I, II. Lapidary Journal, Vol. 38, No. 1, pp. 18–24; No. 2, pp. 292–299. Ploy Sahm See (1988) Gemstones and Sri Lankan Sapphires (Anonymous Thai Language pamphlet attacking AIGS), 36 pp. Yaverbaum, L.H. (1980) Synthetic Gems Production Techniques. Noyes Data Corp., Park Ridge, NJ, USA. Overall, the Gems & Gemology article represents by far the most complete discussion of the subject. It should be required reading for anyone who is interested in learning more about surface diffusion treatments. This article was first published in Gemological Digest (1991, Vol. 3, No. 2, pp. 17–31). The Linde Star was the trade name under which the first synthetic star rubies and sapphires were sold. I say "intriguing" because such gaps between the time that such processes are developed and the time they are brought to market seems to be common in the world of synthetic and treated gems. For example, one August Verneuil, father of the synthetic ruby, essentially had the flame fusion process intact by 1894. But the product was not made public until 1902 (Nassau, 1980). I wonder what he did during those eight years? This, of course, is always the danger with any synthetic or treated stone, and is not meant to reflect badly in any way on Golay Buchel. Labs can also lose and/or damage customers' stones, I am sad to say. AIGS was never mentioned by name; instead all references were to "the Bangkok (name removed)." Because Bangkok had only one gem lab at that time, there is little doubt about to whom they were referring. I bring up the matter of misidentifications by gem labs because I believe that we gemologists have not tried hard enough to inform the layperson (and the dealer/jeweler) that the report is an opinion only, and that mistakes occasionally occur. AIGS is currently redesigning its gem identification reports so that the terms and conditions on the reverse will give an approximate degree of error of such reports, based on the known errors over the past 10 years. Thus, if 10,000 reports have been issued and ten misidentifications were discovered, then the customer might reasonably expect one misidentification out of every 1000 reports issued. The true error rate is probably higher than that because not all errors are discovered or brought to the attention of the lab in question. So far as I know, the error rate of the AIGS lab over the past ten years has been well below 1%, and I expect that other major labs feature a similar low error rate for ID reports. Diamond grading and origin reports are another matter entirely, though; I feel they are less accurate. In any event, we gemologists must get away from this God-like posture that we never make mistakes. All labs can and do make mistakes. Let's admit it – on the document. This idea of "surface heating" (in a crucible at 1800–1900°C, no less) ranks right up there in the gemological fiction hierarchy with the idea that if the stones had only remained in the ground a bit longer they would have changed color. Unfortunately, this type of pressure on gemologists in Bangkok is far from being an isolated incident. Several years earlier, when gemologists at the AIGS lab in Bangkok were the first to uncover and publicize the surface repair ("glass infilling") of rubies, we were accused by some of "trying to ruin the business." If the implications of such accusations weren't so serious they would be almost comical, for the chairman of AIGS is one of Thailand's leading exporters of gemstones; the last thing he would want to do is "ruin the business." This is actually a bit misleading. It has always been crystal clear what certain people want to call these stones – i.e. "Hey, baby, they're blue, aren't they? Let's just call them natural sapphires and get on with the business (wink, wink, nudge, nudge)." The Thai gem association was not alone in failing to see the urgency of this issue. We made two different attempts to inform the above mentioned organization about the contents of the anonymous Thai pamphlet, both of which fell upon ears which, to put it gracefully, were apparently tuned to a different frequency. A market quite firmly founded, I might add, on the sale of rubies and sapphires whose color and clarity bear about as much resemblance to nature as Michael Jackson's current nose. I call it thus because I first heard it from Casper Beesley, the head of American Gemological Laboratories (AGL) in New York. This is exactly the same linguistic problem which has bedeviled a number of Thai gem traders, and must be solved by greater cooperation among gemologists, dealers, retailers, labs and consumer advocates. Just as the ICA Lab Alerts have proven to be a huge success in making the gemological world a smaller place, perhaps the ICA could also grasp the nettle of gemstone nomenclature. AIGS is now working on a comprehensive revision of gemstone nomenclature, which, Allah permitting, will appear in a future issue of the Gemological Digest. The poor old mare has been bloodied so many times already in this magazine's short life, but what the hell. Until gemologists, traders and crystal growers and treaters can agree upon just what the word natural means, I shall continue to bludgeon the beast at slightest provocation. A word I prefer to "enhancement." If Chatham is forbidden from using "enhanced" nomenclature (such as "cultured") for his synthetic emeralds, then it seems only fair play that "enhanced" terminology should not be allowed for treated gems either. Who have safeloads full of heated goods. Totally natural product in terms of color, clarity, and crystal structure. The only human alteration is ordinary cutting and polishing (surface grinding only, no laser drilling or impregnations). Straight angular growth lines following various crystal faces, often in a hexagonal pattern and often featuring associated minute exsolved needles or particles following these growth lines. The lines vary in thickness and spacing, are never curved if examined parallel to the face along which they grew, and always lie inside the stone. They are associated with crystal faces, not with cut facets. Sharp lines are seen best with dark-field illumination, or better, immersion with light-field shadowing illumination. Broad bands or hazy clouds are best seen with immersion and diffused light-field illumination. Exsolved rutile needles and hematite plates ('silk') forming parallel to the hexagonal prism (3 directions, intersecting at 60/120° in the basal plane). The rutile forms knife-shaped twins with tiny re-entrants at the broad end. Sizes vary greatly, some being much longer than others, some appearing as mere dots, some broad, some narrow. Overhead fiber-optic illumination is often best, looking down the c-axis. Minute exsolved particles are often best seen with the fiber-optic light guide from below or to the side of the stone. 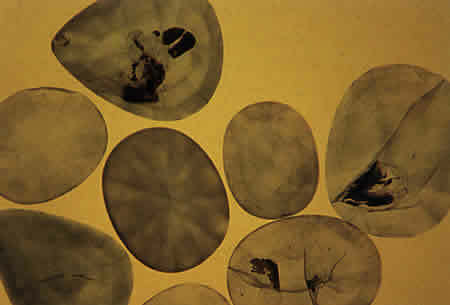 Solid inclusions (crystals) of various types, including zircon, calcite, uranium pyrochlore, mica, apatite, spinel, etc., best viewed in dark-field illumination or via fiber-optic lighting. Crossed polars and immersion may also be useful. Primary liquid and/or gas-filled cavities (known as 'negative crystals') of various configurations (1-, 2- or 3-phase). Secondary liquid inclusions in patterns of infinite variety and thickness; often referred to as fingerprints or feathers. Produced by the healing of fractures, their patterns may often be "wispy" or "veil-like," and so are easily confused with flux inclusions in syn. corundums. Their surfaces should be examined under high magnification with fiber-optic lighting to determine if liquid (natural) or flux (synthetic) fills the small channels. As the natural stone often healed over a much longer period of time, their healing patterns are often far more detailed. The higher viscosity of a flux also contributes to coarser and less detailed healing in flux-grown synthetics. Polysynthetic twinning along the rhombohedron (in 3 directions, but only two in any one plane) meeting at 87 & 93°. These lie about 30–60° off the c-axis. Growth twins may also be seen along other faces. Immersion between crossed polars will separate true twinning from sharp color zoning. True twinning planes will show interference fringes and appear light against a dark background. Long white exsolved boehmite needles which form at the junctions of intersecting rhombohedral twinning planes. Thus their directions and angles are the same as that described in number 6 above. Rhombohedral twinning with the boehmite needles has yet to be seen in the flux-grown synthetic corundum and so is extremely important for identification. Rhombohedral parting (due to exsolved boehmite) and basal parting (due to exsolved hematite). Complete Fe spectrum of lines at 451.5, 460 & 470 nm. is proof of natural (or heat treated) origin. A weak 451.5 line has been found in certain Verneuil and flux-grown (Chatham) synthetic corundums. V spectrum (475 nm.) has been found rarely in Burmese stones. Cr spectrum can be seen in any natural or synthetic corundum with enough Cr content and is of no diagnostic value. Color and/or clarity are synthesized (altered by humans). Partially dissolved silk. The heating process causes a melting and partial resorption of the exsolved rutile, etc., leaving behind tiny dots arranged in a silk-like pattern. In some cases, thick, zoned white "texture clouds" are seen in heat treated corundums (common in heated Sri Lankan stones). The clouds are arranged in zones or bands which run parallel to crystal faces. Use fiber-optic lighting. Glass-filled negative crystals which are the remains of included crystals melted in the heating process. Doughnut-shaped gas bubbles may often be seen frozen in place within these glass-filled voids (common in Thai/Cambodian ruby). Expanded/melted crystals with accompanying tension haloes. These may contain secondary spillage zones immediately surrounding the crystal (not present if the crystal did not melt during treatment). The crystals (or crystal remains) are often surrounded by extremely shiny ('glassy'), circular tension fractures featuring a secondary healing rind at the outer edge where the tension crack began to heal in the oven after fracturing. 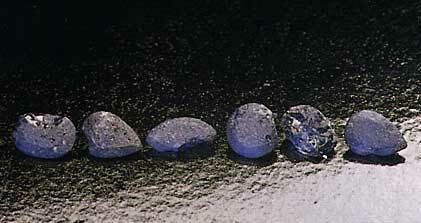 Other crystals turn into round white "snowballs" (with or without haloes) after heat treatment. Lack of red-orange iron-oxide (rust) stains in the fractures of Thai/Cambodian rubies (or other sources). These stains are common in unheated stones mined from iron-rich soils, but are generally removed by the heating process. They can be added artificially, too. Some varieties may show somewhat diagnostic UV fluorescent reactions. In particular, a splotchy, chalky white to chalky blue or green SW fluorescence (it's the colorless areas of the stone that most often show this reaction) is often seen in heat-treated corundums. Examination of the fluorescence under magnification (take care to protect your eyes) may reveal subtle details (such as zoning) of diagnostic use. Heat treated yellow and orange Sri Lankan sapphires show a temporary darkening and browning of their color when subjected to gentle heating (50–90°C). As the stones cool back down, they return to their original colors. This test is extremely reliable, but only works for heat treated Sri Lankan yellow and orange sapphires. The deeper the color of the stone, the more dramatic the change. Caution: the heat may damage certain specimens (but not those already heat treated). Individual color zones (color bands) tend to become more fuzzy and diffused at the edges after heat treatment. While the growth structure of many sapphires (and rubies) shows incredible detail, much of that detail is lost after heat treatment. Surface cavities, pits, naturals and other areas untouched during the polishing process may display a partially melted surface structure, sometimes with adhering droplets and best seen in reflected light. Care must be taken not to confuse this with the smooth but slightly roiled surfaces such as that seen on untreated Burmese ruby rough. Partial synthesis. Color and/or clarity are synthesized (altered by humans). Color is concentrated in a layer at the surface some 0.10–0.50 mm. deep (or less). 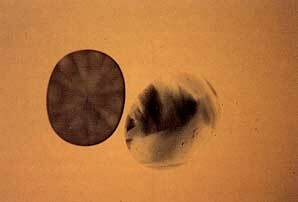 When immersed table down in methylene iodide, this tends to give these stones a darker girdle. Care, however, must be taken not to confuse the reflections sometimes seen from stones with thick girdles with the surface-color concentrations of SDTCs. The color of SDTCs will be seen to follow the facet pattern of the stone exactly. Some facets may be lighter than others, but the color follows the facet pattern of the cut stone. Some facets may have most or all of their color removed by repolishing. Stones may contain substantial internal color, in addition to the thin surface-diffusion color layer just beneath the surface. Facet junctions, girdles, culets and other edges will show color concentrations under immersion. Pits, cracks, cavities, feathers and fingerprints will show a bleeding of color into them. Colors manufactured today include mainly blue, with some red. In the case of glass infilling, the glass may display gas bubbles in the filled area. Often the glass-filled areas show circular holes where gas bubbles have been cut through during faceting. The glass usually has an RI near to 1.50 and so shows a much lower relief than the surrounding corundum. Examination with overhead lighting on every facet and immersion in methylene iodide will cause the filled areas to stand out clearly. Dopping varnish of a brown color is often used to fill in pits due to parting in black star sapphires. The varnish can be removed by soaking the stone in alcohol. Dyes and/or oils may be forced into cracks to improve stones' color and/or clarity. This is possible only with stones containing sufficient cracks to take the dye or oil and so is of limited impact. So-called 'ruby oil' from Thailand is used mainly to allow buyers and sellers of rough to see into the stone more readily (similar to wiping a stone on one's forehead – the oils of the skin allow a better view of a rough stone's color and clarity), rather than for deception. If dyed, microscopic examination reveals color concentrations in the cracks. By stroking cracks under magnification with the hot point, air bubbles present in the dyes or oils will be seen to expand and contract. The oils or dyes may also sweat or drip out from the crack. Certain dyes and oils may display a fluorescence concentrated in the cracks of the stone. Sri Lankan (and Verneuil colorless synthetics)near-colorless, pale yellow and pale pink sapphires may be irradiated to deepen their color. This color is unstable, and will fade (usually within one hour) when placed within 5 mm. of a 150 watt spotlight. Entirely synthetic. The color, clarity and even the crystal structure itself are the product of human manipulation. Curved growth lines (thin striae or bands), seen best at roughly 90°to the boule's length. These curved lines are not concentric. Gas bubbles, round or elongated at 90°to direction of growth lines, from pinpoints to large distorted doughnut-shaped spheres or highly irregular worm-like distortions. Usually distributed in clouds which follow the curved growth structure of the boule. Polysynthetic twinning along c-axis ('Plato Lines'), seen between crossed polars with immersion in sets of 1, 2 or 3 directions. Polysynthetic twinning along rhombohedron, sometimes with accompanying boehmite needles identical to natural corundums. Induced fingerprints and feathers entirely similar to natural corundums. Traces of the seed rod or seed crystal. Found at the base of the boule and featuring frosted surfaces at the seed junction. Some varieties may show useful UV fluorescence. The V-dopped color-change type shows a diagnostic spectrum line at 475 nm. Irregular color distribution and rounded facet junctions of blue varieties in particular may cause confusion with surface diffusion- treated corundums. Extremely fine and narrow curved growth lines (curved striae), which may be concentric. Gas bubbles of various sizes, shapes and orientations. Faint "smoke-like" or "rain-like" wisps of tiny particles, probably representing remnants of a flux used to aid melting during growth. Small unidentified black prismatic crystals in groups (Inamori). Extremely fine exsolved clouds of what may be rutile silk in the red star material (Inamori). Secondary lamellar glide twinning along the rhombohedron faces. Twin planes may intersect at 87 and 93°, and may also show long white needles (boehmite?) at the junctions of intersecting twinning planes. Best seen in immersion with crossed polars. Primary flux-filled negative crystals, often only partially filled (2-phase) and featuring a characteristic "crazed" surface appearance. Primary flux in Ramaura stones often has a yellow-orange color and may show distinct growth striations on flux surfaces, open cavities and crystal faces which mirror the color zoning. 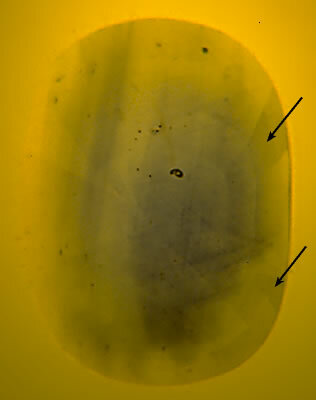 Secondary flux-filled fingerprints, feathers, etc. Tiny flux particles, often arranged in "streamer" or "comet"-like patterns (such as the 'rain' in Kashan stones). Platinum plates, flakes, crystals, needles, etc. (Chatham, Knischka); black (platinum-rich?) growth planes (Chatham only, especially along the seed crystal). Tiny, oriented, exsolved silk-like needles and/or particles in zoned clouds (Chatham and Knischka). Polysynthetic and growth twinning in various orientations, but without the boehmite needles often present in the natural, Verneuil and Seiko (floating zone) synthetics. Straight growth lines running parallel to crystal faces and meeting at specific angles. Unusual growth-line boundaries (Ramaura). Rounded transparent crystals (possibly chrysoberyl or corundum itself) of low relief (Chatham). Color: Highly saturate, medium to dark red simulating the color range of fine Burmese/Vietnamese or Thai/Cambodian rubies. Certain stones may display a slight cloudy or sleepy appearance due to reduced transparency. Internal graining (zoning): This is the most obvious and striking feature of these stones and resembles somewhat the graining features found in Russian hydrothermal synthetic emeralds. It is this strong graining which renders the stones slightly sleepy. In most directions the graining appears in a striated pattern, although it may appear roiled when looking in directions oblique to the faces along which it forms. Strong lines are seen parallel to the basal pinacoid. At certain points parallel to the basal plane a distinctive "Christmas-tree" pattern is seen. It is not known whether this is a result of twinning or simply a growth zoning. Solid inclusions: Golden-colored inclusions of two types have been found. These consist of well-crystallized, thin to thick platelets of opaque metallic alloys. One type is mainly copper (Cu) with traces of iron (Fe), nickel (Ni) and titanium (Ti); the other is mainly copper, but with traces of iodine (I) and sulfur (S). Needles: One long, slender needle has been observed. It appears transparent and colorless. It is not known whether it is solid or negative. Secondary healed fractures: Healed fractures have been observed, similar to those found in natural rubies. These are transparent and may be two-phase (liquid and gas). These consist of two or more individual pieces of corundum, synthetic corundum or other materials which have been cleverly assembled so as to closely imitate the appearance, properties and/or identifying characteristics of genuine corundums. Base = Verneuil synthetic corundum (any color)with curved growth lines and possibly gas bubbles in the synthetic portion. More rarely, flux-grown synthetic corundum is used (with the accompanying flux inclusions), but this is not often seen due to the higher cost. Most deceptive are doublets where both top and bottom are natural corundum. Separation Plane = A distinct join will be seen completely unbroken around the entire stone. It is usually at the girdle, but may also be found on the pavilion, or even on the crown. The glue layer used to join the two pieces often shows curved brush strokes and flat gas bubbles; since the glue's RI is quite different from that of the corundum, it will stand out in high relief when the stone is immersed in methylene iodide. At times, a corundum may be seen with a crack penetrating across the entire stone and the question arises as to whether the stone broke apart during cutting and was glued back together. Use of the hot point under magnification may melt portions of the glue, causing the bubbles to expand and contract in the crack, indicating assembly. Soaking the stone in a mild solvent (such as alcohol or acetone) may dissolve the glue, thus proving assembly, but this is a destructive test. Top = Verneuil syn. blue sapphire. Base = Verneuil syn. blue spinel colored by cobalt. Separation Plane = As above. Note: This type is probably made to give the rich Co-blue color (which may resemble very fine unburned Sri Lankan sapphires), but adding the syn. sapphire top gives the properties of corundum and toning down the Co-blue color just a little to make it appear more natural. Top = Verneuil syn. yellow sapphire cabochon. Base = Genuine black star sapphire slice. This gives the appearance of a "golden star" black star sapphire. Base = Mirror backing in which has been inscribed numerous fine lines crossing at 60/120? to create a six-rayed star. Top = Transparent Verneuil syn. ruby (or sapphire) cut as a hollow cabochon. The stone's color comes from this piece. Center = Natural star sapphire cabochon of poor color which is cut to fit exactly inside the top piece. Base = Natural corundum cut as a parallel slice to seal off the back of the stone and hide the center piece.